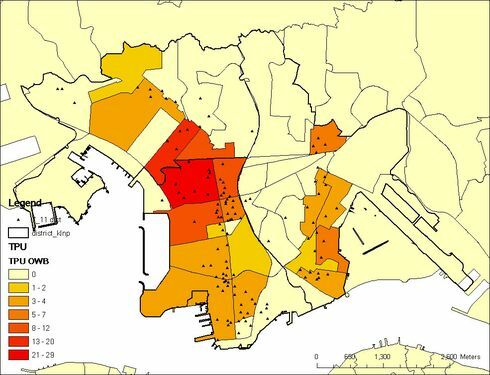 Map shows the distribution of the residence locations of patients who attended a social hygiene clinic in North District (green cross) in a one-month period in 2008. Social Hygiene Service is a specialist clinical service for sexually transmitted infection in Hong Kong. Whereas a majority (32%) of the attendees lived in the same district, some had come from Taipo, Shatin and Yuen Long, and there were scattered cases from Kowloon. In addition, 3.5% lived in Guangdong, China. 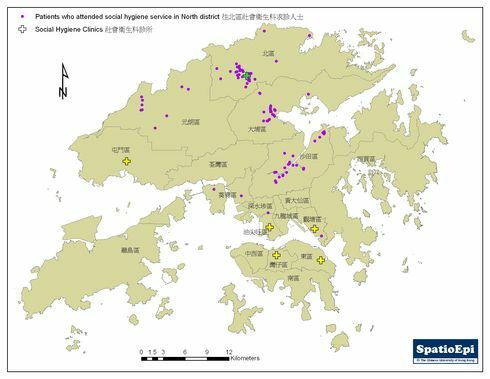 Operating under the Department of Health, there are currently 6 social hygiene clinics in Hong Kong, some further divided into male and female clinics. The social hygiene service is responsible for the prevention and control of sexually transmitted infections. Its dermatology clinics also manage skin diseases and Hansen's disease. The social hygiene service provides free medical check-up, treatment and counselling on sexually transmitted infections for citizens on a walk-in basis, without the need for doctor's referral.